Dr Brendan Nelson AO and Graeme Dunstan, Peacebus Captain, have been dialoguing about Anzac, peace and lamentations from when Dr Nelson was first appointed Director of the Australian War Memorial in December 2012. Graeme conducted the first Anzac eve Peace Vigil in 2011 but relations with the then director, Major General Steve Gower AO, Graeme’s former Battalion Sergeant Major while he a staff cadet at Royal Military College, Duntroon, in 1963 had been prickly. 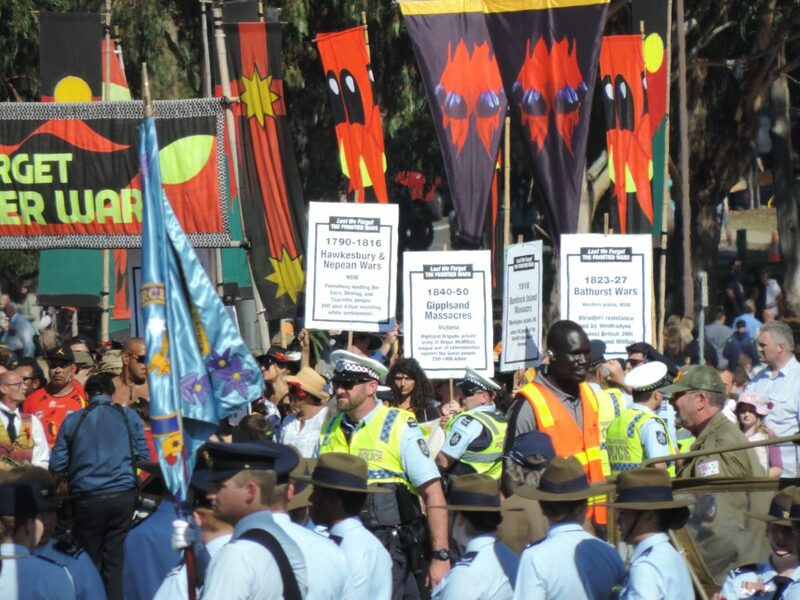 Only the goodwill of the Australian Federal Police had enabled the event proceed. So when Dr Nelson took office, Graeme, guessing his email address, sought a meeting. With no Personal Assistant yet appointed to vet his emails, Dr Nelson received the message directly and responded likewise, accepting. The two hit it off. Mutual respect prevailed and Dr Nelson expressed himself interested in innovation and creating community participation events which promoted peace at the War Memorial. Every year since there has been a meeting with Dr Nelson in his office with Graeme accompanied by women from the Chorus of Women in which the occupation of the War Memorial Forecourt for the performance of a lantern-lit liturgy of lament for peace had been negotiated. To understand the depth of this goodwill one needs to understand that the Anzac eve Peace Vigil takes place just 8 hours before the Anzac Dawn Service and uses the same space. (The Dawn Service is the biggest event of the AMW calendar – 120,000 attended in Anzac 2015 for example.) And this with no fees, no disclaimers signed and no public liability insurance paid. Getting access to Dr Nelson in the lead up to Anzac is not easy and the 2018 meeting had been negotiated 3 months in advance. Alas come the morning, Graeme got carried away with his meditation and yoga practice by Lake Burley Griffin and missed it. An elder’s moment maybe. The Chorus women were there to carry the day and negotiated a workable agreement without Graeme’s presence. But it seemed to Graeme that his disrespect and neglect had weakened the relationship somewhat, hence the discordant tone in the dialogue that follows. The following email dialogue took place in the context of the fourth annual Frontier Wars Story Camp and preparations for the seventh annual Anzac-eve Peace Vigil and Lest We Forget the Frontier Wars Anzac Day March. I received a copy of your media release regarding the proposed Reconciliation Dance on Anzac Day 2018 at the Australian War Memorial. Thank you for keeping me informed. On Anzac Day we remember all Australians who have served in uniform in times of both peace and war. Almost 4000 veterans and current serving personnel will gather to reflect and remember experiences, mates, and comrades standing shoulder to shoulder among those proud Aboriginal and Torres Strait Islander veterans. These men and women have fought for the right to freedom of expression to which you are also entitled; however, this day is dedicated to them. Thousands will attend the Memorial for the purpose of honouring them as they march across our Parade Ground. I do not believe the action you are proposing will in any way positively further the reconciliation cause to which we all aspire. As Director of the Australian War Memorial I cannot and do not support any activity which intrudes or impacts on our national day of commemoration. As you are aware, I am supportive of reconciliation and actions that progress the healing of our nation. In this regard, I have spoken with the National President of the Aboriginal and Torres Strait Islander Veterans and Services Association (ATSIVSA) and he has proposed that the Reconciliation Dance group could perform in Remembrance Nature Park at the base of Mount Ainslie following the ATSIVSA Anzac Service held at the Aboriginal and Torres Strait Islander Memorial on the lower slopes of Mount Ainslie. This would be at approximately 7.15 a.m. on Anzac Day, and would be well received by the many attendees to this ceremony each year. Should you agree to this approach, the Australian War Memorial would formally acknowledge and raise awareness of the performance in the script at the end of the Dawn Service. I would appreciate your considered response to this proposal. Thank you for your letter and its warm tone. In it, you suggest we move the proposed Reconciliation Dance from outside the Australian War Memorial at the top of Anzac Parade at the conclusion of our Frontier Wars March (at about noon), to Remembrance Park at 7.15 a.m. I ran this past Uncle Marbuk Wilson, co-creator of the Reconciliation Dance. His response was prompt and curt. Referring to the Aboriginal and Torres Strait Islander Memorial on the lower slopes of Mount Ainslie, he retorted, “Just like the Missions. Out the back and out of sight. I want my people upfront!”. There is you answer, my friend. The men who take up the challenge to paint up and do this dance will be upfront in the Lest We Forget the Frontier Wars March to the Australian War Memorial on Anzac Day. At the police line, they will create a performance space and perform their dance using didgeridoo, clapsticks, and smoke.. Sounds harmless to me. The media cameras will love it of course. So will the crowd watching the Anzac Day march, and so will the witnessing nation. 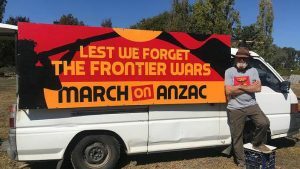 I remember saying to you years ago that we Anzac advocates for recognition of the Frontier Wars by the Australian War Memorial are knocking on a door, and we intend to keep on knocking till the door opens. Our message to you and the directors of the Australian War Memorial is to open up to the Frontier Wars. To admit them. 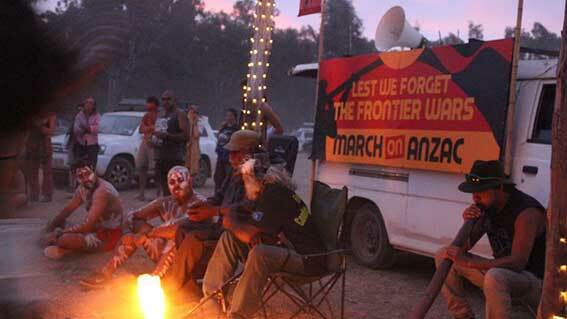 Recognition of the Frontier Wars is the gateway to reconciliation. If that distracts from the RSL ceremonies in the AMW, so be it. Recognition of the Frontier Wars requires a big re-think for all Australians, including the RSL and the Australian military generally. It disturbs me that the RSL is transforming the Anzac Day March from a solemn remembrance of the war dead by veterans and their families to a living soldier parade to glorify militarism. But that is not the issue here. No attempt will be made to disrupt the RSL ceremony within the AMW. But you may hear some knocking. You know how much I admire the dignity and civility which you bring to the task of holding the nation’s war grief. 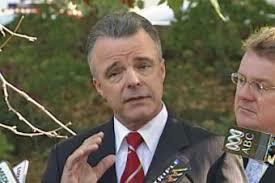 And it is right that you should defend the dignity of the AWM and its ceremonies. You have a role, and the role brings responsibilities. But how I yearn to have you come to the Tent Embassy to sit at a campfire with Uncle Ned and Uncle Marbuk and others for some yarning. How I yearn to see you set aside your suit and surrender to the ochre! What a spectacular and transformative moment that would be in the story of the nation. I received your Media Release of 22 April and planned actions to deliberately disrupt the Anzac Day National Ceremony. I did so with extreme disappointment and regret. Disappointment at the deep disrespect it proposes to the veterans and service personnel, both Aboriginal and non-Indigenous, who will be gathered to commemorate those who have given their lives in the service of our nation. I regret that the critically important path to reconciliation will not be furthered, but more likely damaged by the actions you intend to undertake. I would hope you would recognise the significant effort the Australian War Memorial invests in being an open, welcoming and unifying institution. To welcome and honour veterans and their families with open arms in a world in which they can feel strangers and not well understood, is an essential function. A standing offer to raise awareness of the proposed Reconciliation Dance if it builds on the successful foundations of the Indigenous Wreathlaying Ceremony on Anzac Day morning. Additionally, at our March meeting I shared with your colleagues our advanced plans to install a significant Indigenous sculptural commission which will recognise and commemorate the military service and experience of Aboriginal and Torres Strait Islanders. This important sculpture, to be located in a prominent area of the Memorial’s grounds, will honour the legacy and the equality of Aboriginal and Torres Strait Islander military service and sacrifice, and the enduring impact on country and nation. Furthermore, permanently displayed with great pride in the entrance to the Memorial’s galleries is a significant addition to our collection a painting created by 19 senior male artists of the Anangu Fitiantiatiara Yankunytiatiara ‘APY’ bands, commissioned by the Memorial to tell their story of Aboriginal Australians defending Country. The distinguished Aboriginal men held hands and said a prayer in language over the Tomb for all those Australians who have died for our nation. Our program extends beyond the walls of the Memorial with the Indigenous exhibition For Country for Nation which has commenced its national tour in Bundaberg, Qld, after a successful 12-month display in our galleries These are just some of the programs we are undertaking to recognise the important Indigenous story encompassed by the Memorial’s charter. The Council of the Australian War Memorial acknowledges the protracted and tragic violence that occurred during the colonial dispossession of Indigenous Australians. This story and the story of Indigenous opposition to European settlement and expansion should be told. However, this Australian History should be told at the National Museum of Australia, not the Australian War Memorial. I might add that this is the strong view of the Aboriginal and Torres Strait Islander service and Veterans Association. Your proposed actions will not achieve your objectives. Indeed they are likely to set them back. l implore your continued respect of our mutual goal of recognition of and continued reconciliation with Indigenous Australians. Were nonindigenous people to set out to deliberately disrupt an Aboriginal sacred ceremony, I would be disgusted and ashamed. Actions of the nature you propose on Anzac Day and the sanctity of what is honoured will elicit similar emotions. Be assured that there will be no disruption of the Anzac Day National Ceremony. My apologies to you if I have caused you unnecessary alarm. The Anzac Day Frontier Wars March will approach the Memorial as it has done in previous years carrying wreaths, stand in silent witness till the Ceremony is done, then lay the wreaths on the Tomb. The only difference is that there will be a dance by Aboriginal men after our arrival at the police line. Produced by Uncle Marbuk Wilson, this dance will take no more than a few minutes. You will be pleased to know Uncle Ned Hargraves has decided to produce his Reconciliation Dance at the Sacred Fire at the Tent Embassy at sunset on Anzac Day. You are invited to come witness this. And participate, too, if you should choose. I do appreciate the good work underway at the Memorial to move towards reconciliation with the land’s First People and I am grateful for the collaborations we have had producing the Anzac-eve Peace Vigil. I am glad to hear that the Council of the Australian War Memorial acknowledges the protracted and tragic violence that occurred during the colonial dispossession of Indigenous Australians, and wants these stories told. Our difference is that you see this as the responsibility of the National Museum, not the War Memorial. Imagine suggesting the stories of WW1 ought be museumised rather than memorialised. It’s an insult, dear Brendan. It’s a diminution of the suffering of the longest war, with the greatest casualties and with the greatest impact in terms of transformation of landscape and society. It’s a duck and dodge excuse, and, as such, a stain on the dignity of the Memorial. So our door knocking continues at another Anzac. As does our friendship. Lest we forget the Frontier Wars. Wonderful fascinating dialogue between Graeme and Brendan. Well done Graeme, Uncle Marbuk Wilson, and Uncle Ned Hargraves.